Just a quick post to thank you. Thank you for connecting with me – for allowing me to touch your life and for touching mine. I wish you a wonderful week – full of peace, love, joy and gratitude! Give yourself the gift that comes from slowing down. Celebrate the life you are living – in this moment. Rest, be still, breathe deeply, smile and soften. If your life isn’t going quite how you want it to or how you thought it would “turn out” – it’s ok. Let it go. Let go of the ideas of how you think your life should be so that you can see your life in a new light. Your heart is ready to release the past so that you can see the beauty that comes from forgiveness and gratitude. Sometimes you have to open and soften your heart a little so you can see it. Let your light shine bright this week. Feel your heart expand with gratitude and share that love and appreciation with all those you meet. It will make a difference in their lives. And it absolutely will make a difference in yours. And thank you, my friend, for being you. I have opened registration for Inside Out: A Creative Adventure of Self-Discovery from now through December 4th! Once you enroll, you will have access to the full 8-lessons, guest posts, Q & A bonus videos and more for an entire year. 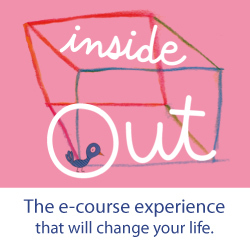 You will become a member of our Inside Out private online community for a lifetime. Gift Certificates for the Holidays are now available! *Please note: In 2016 I will be raising the registration fee. If you were planning to take the course in the near future, now would be a good time for you to take advantage of the lower price.